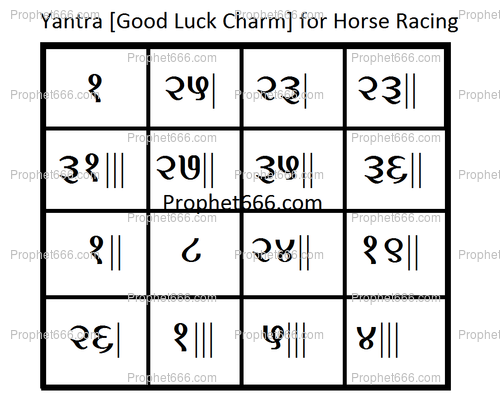 The Yantra, which, I have described in this post is a Indian Occult Voodoo Spell, which is believed to increase the chances of placing winning bets in Horse Racing and other sports related to racing, like Car and Dog racing where Sports Gambling and placing of bets takes place. Given below is the simplified procedure of preparing this talisman at home. The practitioner can prepare the Yantra on any auspicious date, any kind of full or partial Solar or Lunar eclipse or any Hindu festival. The Yantra, which, I have shown in the image should be prepared on a Bhojpatra using the paste of Ashtagandha and written with a small pointed wooden stick. After drawing the Yantra, it should be offered Dhoop [perfumed incense]. 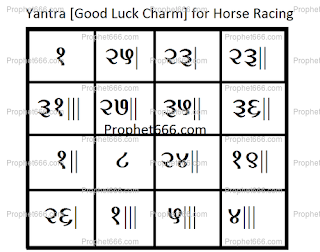 Then finally, the Yantra should be inserted into a Metal Locket and worn around the Right Upper Arm while going to the Race Course or to place bets on horses or any other racing games of chance. Note- Please note that I do not advocate, endorse or encourage any kind of gambling, including Sports Gambling. Respected Sir, You have given remedy for money problems on 28 May 2012 to feed fishes, so here I want to ask can we eat fish if we do that or not. Thanks in Advance. Regards. There should be absolutely no problem in performing the remedy, even if you eat fish.